A Rinkya Blog: Hello Kitty-fy Your Cat! 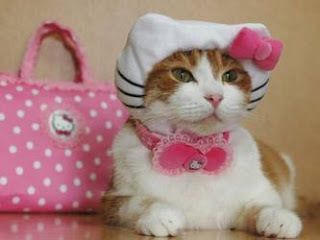 We all know Japan is obsessed with Hello Kitty (cars, laptops, banana holders, headlights, etc) , they are also obsessed with dressing up their pets as well. Bringing the two loves together is the Hello Kitty outfit for your cat (or if you so choose, you can place it on your poor dog) Outfit comes with a purse and some pink bows! The Hello Kitty costume is available for 18,900 yen ($180) and can be purchased via Rinkya Stores- Japan Shopping Service!